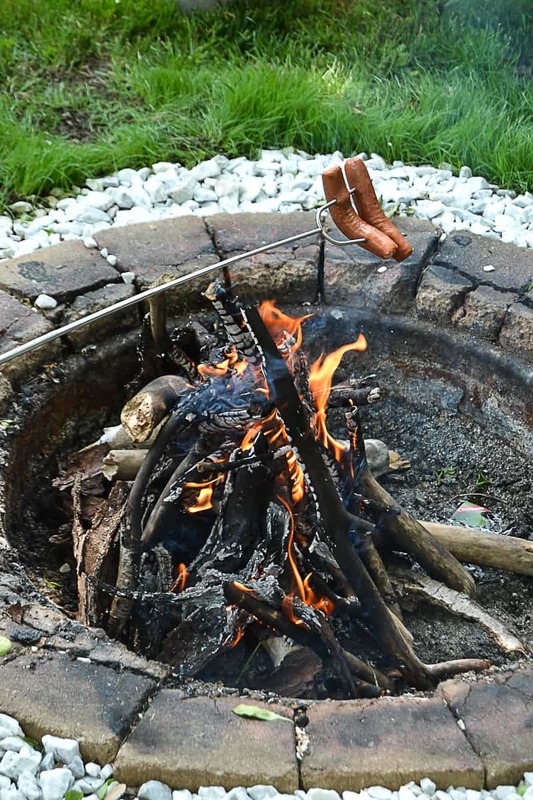 Camping Activities That You Can Do In Your Own Backyard! I want to thank Thiesens for partnering with me on this camping activities post. All opinions are my own. If I have said it once, I have said it a thousand times, I look forward to the summer break just as much as our kids do. I love having them home during the summer. The relaxed schedules and warmer weather are something I look forward to after a long school year. With that said, it is also very bitter-sweet for me too because I know our summers spent together are getting fewer and fewer because they are growing up so fast and won’t be spending as much time with mom in the summer. Until that happens, I want to make the most of the summer time we still have. A few years ago, we had a Theisens store open up very close to our home. Before summer break started, I was exited to head there to see what kinds of things I could find that would make our summer extra special. *A little fun fact about Theisens that you may not know is that it was started in Dubuque, Iowa! Dubuque is only about an hour away from where we live and when we were kids, our parents would take us there a lot for vacations. Now, we take our kids there too. It is fun to work with a company that was started to close to home! All spring, we have all been working so hard on our latest flip project. I told the family that once it is sold (we close at the end of June!!!) we need to celebrate and make this summer out best one yet. 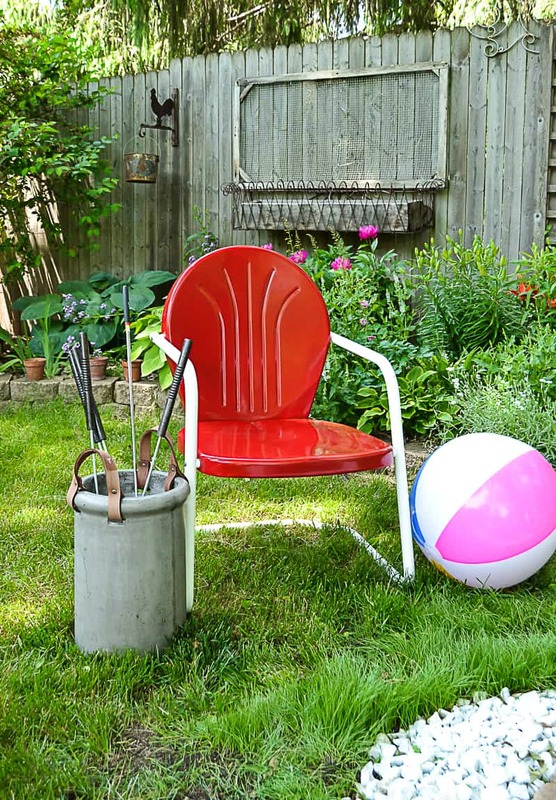 We have booked a vacation, but I wanted to find some new camping activities that we could use at home or away and that would make this summer fun and memorable. On our trip to Theisens, the entire family got lost browsing around in different departments. Gabrielle got lost in the pet section because she has been begging us to get a puppy. She thought our summer would be the best yet if we added a furry friend to the family. I told her with all the trips and weekends away she wants to do this summer, a furry friend would put those to a halt because he/she would need us at home a lot in the beginning. She decided to move away from the pet section and see what else she could find. 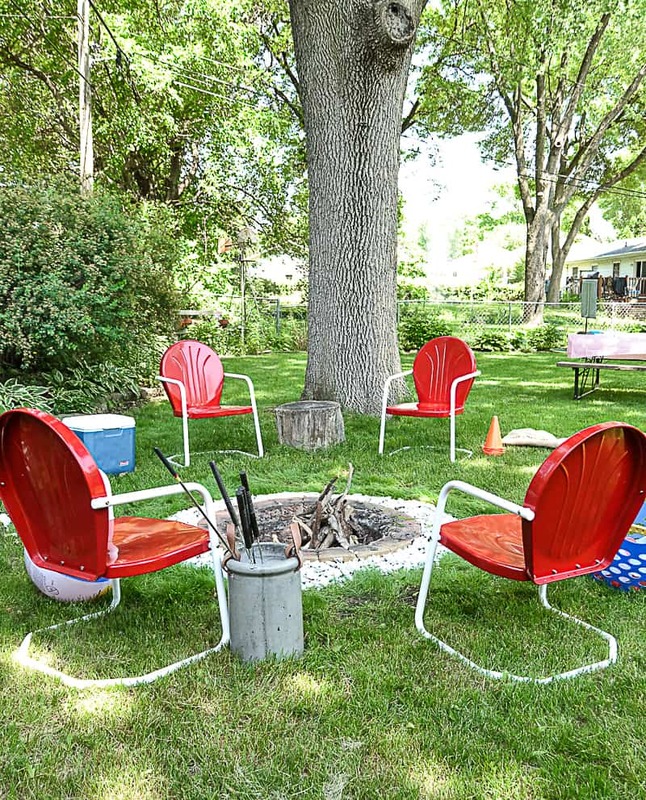 As the kids were off exploring (and getting the free popcorn that Theisens offers), I came upon the Retro Red Chairs and knew this would be the start to a great backyard oasis. 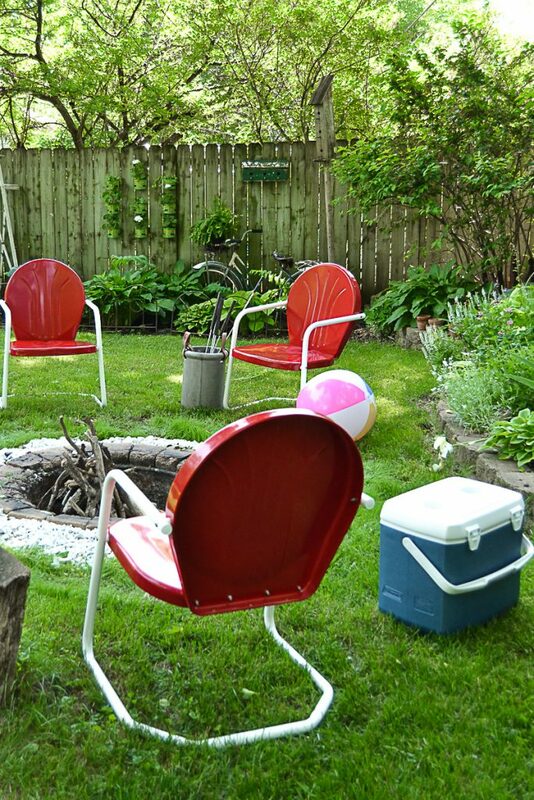 We started giving our backyard fire pit area a makeover and needed seating around it. These chairs were perfect! 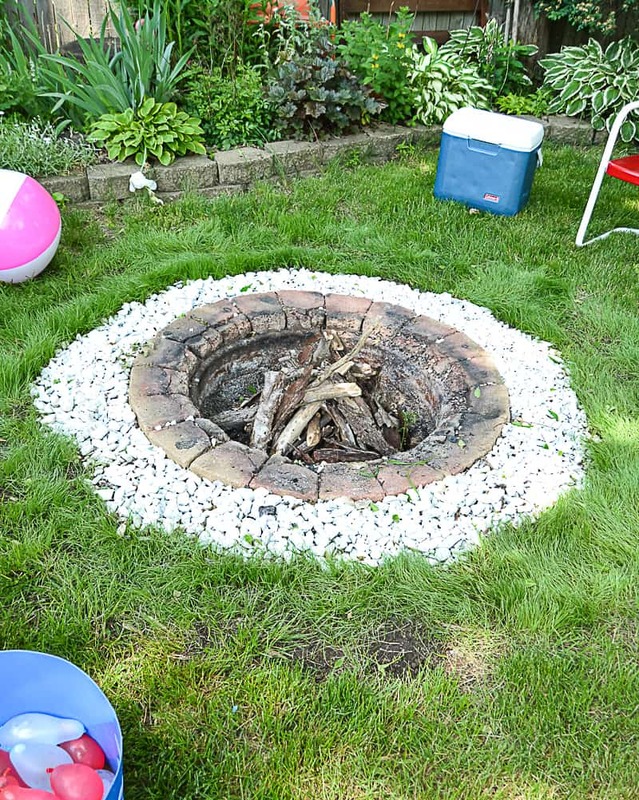 Now that we had grass growing around the fire pit and added some white rock around the ring, it was time to find some camping activities to add to our summer backyard fun. Theisens had so many options to choose from. We needed a new cooler so we grabbed one of those. When we have these staycations in our backyard, we really try to bring everything we can outside so we don’t have to go inside. The cooler was packed with drinks and snacks for us to eat while playing outside. I also picked up a vinyl tablecloth to put on our curbside picnic table. This tablecloth is heavy-duty. I rinsed it off after we ate and hung it up to dry. I will use it over and over again. As a mom, one of my favorite things about backyard staycations is eating outside. The mess stays outside and it is just easier to cook over the fire because the clean up in a breeze. We picked up some fun new tools to use over our fire pit too. The retractable camping fork is a game changer for the kids. They can cook their own hot dogs while I am getting other things prepared. 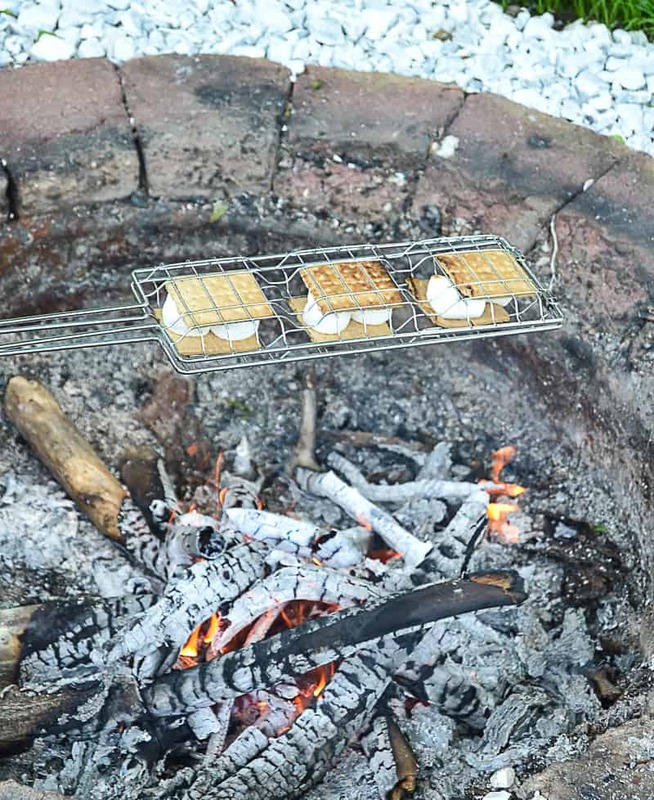 Where has this smore maker been all our lives? I couldn’t find the link online, but you can find them in stores. We all loved that the graham cracker was able to get charred from the fire as well this way. We had a long conversation about what else we can make in this thing. One of my favorite things that I found at Theisens was the concrete planter with the handle. Not only did I love the look of it, but it stored our new camping utensils perfectly when we weren’t using them. I don’t know if I will use it as a planter or keep it out for this use. 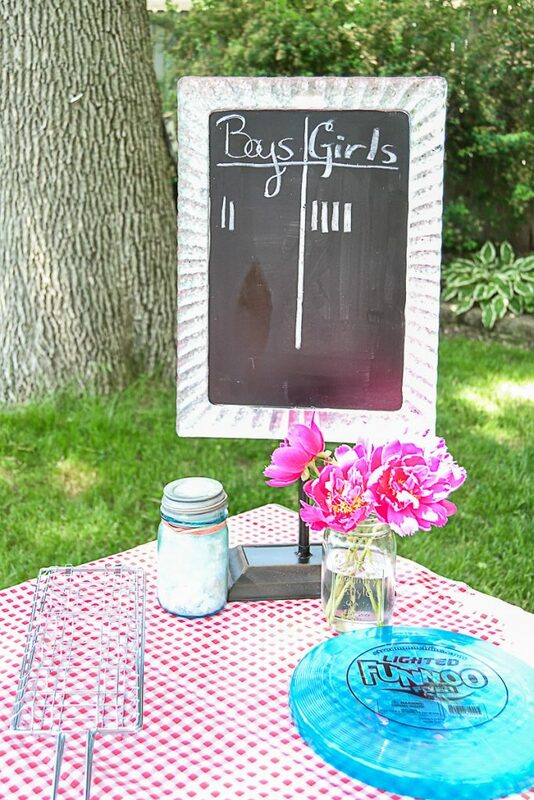 I picked up the Tabletop Chalkboard because we can use this over and over again as well. For the camping activities during this staycation, we were using it to keep track of who was winning the games we played that day. The games we picked up at Theisens were potato sacks for $1 for sack races, a light up frisbee, water balloons, a beach ball and some water toys for our upcoming vacation. We also grabbed some candy and snacks as well. What is your favorite summer memory? How are you going to make this upcoming summer more special than the last? 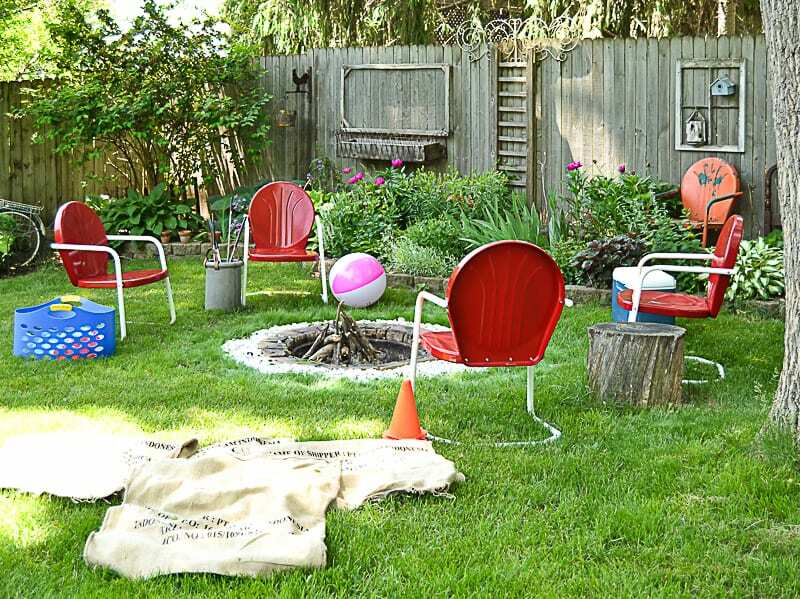 I love your firepit, nicely done, and relaxing backyard.